Product prices and availability are accurate as of 2019-04-23 13:58:29 UTC and are subject to change. Any price and availability information displayed on http://www.amazon.co.uk/ at the time of purchase will apply to the purchase of this product. 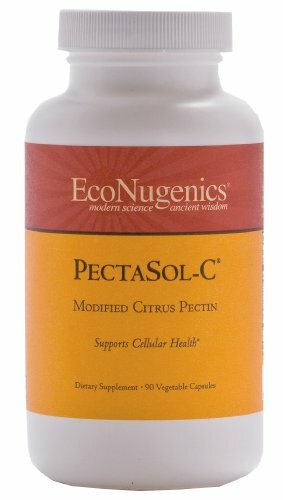 Modified Citrus Pectin is a modified version of pectin, that can enter the blood stream and bind the outside of a spreading cells. This means that the modified citrus pectin helps keep cells from attaching to blood vessel walls, it can helps top cancer cells from binding to their desired targets-- keeping them from metastasizing-- and it can also reduce the production of new blood vessels in tumors. In the Dog Cancer Survival Guide, Dr. Dressler believes that modified citrus pectin makes a nice addition to a dog's diet because of the anti-cancer effects. For more information on modified citrus pectin, precautions and dosage, please review Chapter 13 of the Dog Cancer Survival Guide. Supplement Facts Serving Size: 6 capsules Servings Per Container: 15 (90ct) or 45 (270ct) Amount Per Serving %DV Total Carbohydrate 4 g 1% Dietary Fiber 3 g 12% Sodium 170 mg 7% Potassium 410 mg 12% PectaSol-C Modified Citrus Pectin 4.8 g Percent Daily Values (%DV) are based on a 2,000 calorie diet. * Daily Value not established Other Ingredients: Vegetable capsule (natural vegetable cellulose, water), stearic acid, magnesium stearate, microcrystalline cellulose, silicon dioxide.